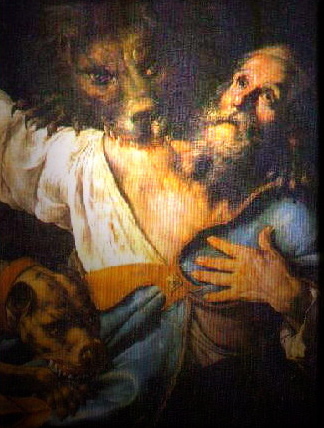 Almighty God, we praise Your Name for Ignatius of Antioch, pastor and martyr. He offered himself as grain to be ground by the teeth of wild beasts so that he might present to You the pure bread of sacrifice. Accept the willing tribute of all that we are and all that we have, and give us a portion in the pure and unspotted offering of Your Son, Jesus Christ, who lives and reigns with You and the Holy Spirit, one God, now and forever. One of first great crises of the earlier Church was when the last of the 12 Apostles died. Who could ever replace them? Already the Lord provided the answer: bishops. When I hear the word “bishop”, visions of churchly finery come to mind: croziers, mitres, elaborate vestments and the like. Not in the 1st century nor for next 2-3 centuries! Bishop is the word used to translate the New Testament Greek: episcopos which means “overseer”, one who provides oversight to the doctrine and faith of the congregation. An “episcopos” preached and administered the Sacraments which means a bishop is a pastor. He presided at the Table of the Lord. What is the Biblical and evangelical understanding of the Lord’s Supper in relation to our lives and souls in His Church? Some have written that Christian doctrine evolved from the original sayings of Jesus into the Christianity we have today. But given the chronological proximity of Ignatius to the Apostolic era, this can not be so and especially when we read his letters. In them, it is clear he and the earlier Church were continuing the apostolic doctrine as taught verbatim by Jesus Christ in the power of the Holy Spirit and were already combating heretics and their heresies. As, then, the Lord did nothing apart from the Father [cf. John 5:19; 8:28], either by himself or through the apostles, since he was united with him [cf. John 10:30; 17:11,21,22], so you must do nothing apart from the bishop and the presbyters. Do not try to make anything appear praiseworthy by yourselves, but let there be in common one prayer, one petition, one mind, one hope in love, in blameless joy—which is Jesus Christ, than whom nothing is better [cf. John 10:16; Eph. 4:3-6]. 2. All of you must run together as to one temple of God, as to one sanctuary, to one Jesus Christ, who proceeded from the one Father and is with the one and departed to the one [cf. John 8:42;14:12,28; 16:10,17].